Miklós Rózsa, an intellect and a gentleman of the old school, was an artist with an enormous contribution to the art of film music. His music has been both light in tone and heavily dramatic in feeling, and he was one of very few film composers highly regarded enough to be accepted to the classical stage as well as in the motion picture studio. His music is timeless, his melodies are of rare beauty, his approach was always unique having the ability to deepen to the story of a film, enhancing the drama and revealing everything that is not shown on the big screen. With this tribute, we honor the legendary composer through a journey to his illustrious career. Rózsa was born in Budapest, Hungary in April 1907. His musical introduction to the traditional music of his homeland began from a very early age. At the age of five, he was urged to learn playing the violin, the viola and piano. It wouldn’t be an exaggeration to say that he actually read music before he could read words! At the age of eight, he performed part of a Mozart concerto for violin live in front of an audience. At the age of eighteen he composed his first piece of music for flute, oboe and cello based on a poem he wrote titled “Hungarian Twilight”. Disliking the society of his birthplace, he left in order to study chemistry in the University of Leipzig. However, his musical genes rebelled and he abandoned chemistry for music in that city’s famed Conservatory of Music. During this period, Rózsa started to work on his personal musical voice and this resulted in his first compositions of classical repertoire. In the years to follow, compositions like “Hungarian Serenade” and “Theme, Variations, and Finale” were performed by some of the most important conductors in Europe and his reputation started to bloom. In 1928 he signed a contract with music publishers Breitkopf and Hartel for his symphonic and chamber music, and three years later his music met concert success in Paris, and before long his reputation as a classical composer was well established. In 1934 Arthur Honegger, the eminent Swiss-French composer, and Miklós Rózsa, gave joint concert in Paris. The net proceeds to both were depressing and the young Hungarian composer was disappointed. He asked Honegger how he managed to make a living. “I write music for films” was the answer. Rózsa was intrigued and the next day went to see the French version of “Les Miserables”, for which Honegger had written the score. He was fascinated with the prospect of writing music for dramatic films. A year later, Rózsa received an invitation from the Hungarian Legation in London to come to England and compose the music for a ballet. The composer loved London and decided to live there after his ballet “Hungaria” was very well received. 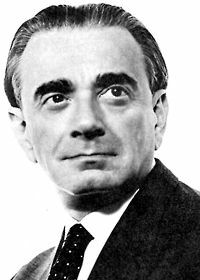 One day, during the ballet’s two year run, the French-Belgian director Jacques Feyder saw “Hungaria” and asked Rózsa to write the music for a film he was going to direct in London for Alexander Korda’s production company. The film was “Knight without Armor” (1937) starring Marlene Dietrich and Robert Donat, and it became the first screen credit for the young composer. Intuitively, Rózsa sensed that the new medium of sound motion pictures might offer him a forum in which to make a significant artistic contribution. Quickly establishing his own unique sound and presence in a crowded arena, Rózsa transformed his classical sensibilities into a richly individual voice within the motion picture community, composing nearly one hundred film scores between 1937 and 1982. “Knight without Armor” was the catalyst of a very close and trusted collaboration between Rózsa and Korda on a number of well received films including “The Four Feathers” (1939), “That Hamilton Woman” (1941) and “Lydia” (1941). The assignment on “The Thief of Bagdad” (1940) would be a fortuitous one for Rózsa. When war broke out in Europe, the cast and crew of the film was transferred to the United States to shoot additional scenes. The composer sensed that his future in the art of film music was in America. When Korda’s production company returned to England, he decided to remain to the United States. A great career was about to unfold in America, a career that spanned several decades and discernible stylistic changes. By having a close look at Rózsa’s filmography, we can break up his film composing credits into four creative periods: the oriental/exotic/fantasy period (“The Thief of Bagdad” and “The Jungle Book”), the psychological period (“The Lost Weekend” and “Spellbound”), the film noir/gangster period (“The Killers” and “Naked City”) and the last one, the historical/Roman/epic period (“Quo Vadis” and “Ben-Hur”). Each period portrays a different musical virtuosity and displays Rózsa’s enormous expertise in all these musical topics. Alexander Korda’s lavish oriental fantasy in Technicolor “The Thief of Bagdad” (1940) was the production that was really the first true showcase for the extraordinary film scoring talents of Miklós Rózsa. It really is foreground rather than background music. Leitmotifs abound and exotic atmosphere is omnipresent in the richly textured conceptions, but most important is Rózsa’s vibrant singing lyricism. Another exceptional case of film scoring in the exotic vein was the Korda version of “The Jungle Book” (1942). Rózsa composed in the manner of authentic Indian ragas for the Hindu scenes and wrote characteristic and diatonic music for the main part of the film. The approach is operatic; each of the principal characters, whether animal or human, has an individual motif. The main theme is that of the jungle – depicting the eternity and vastness of nature. The composer adapted his music from the film for a 28-minute concert suite with narration (based on Rudyard Kipling’s original writings). This historical release is well known as the first American film score to be commercially recorded by a major company. Rózsa’s first contract with a major Hollywood studio came at Paramount in 1943. It soon was evident that Rózsa’s approach to writing departed markedly from the norm. He engaged in copious research into the background of a film’s subject matter and characterization before ever committing a single note to paper. Τo the consternation of the studio executives, he often found the use of non-melodic sound and unconventional instrumentation to be most appropriate. When it was pointed out by the head of Paramount’s music department that the score for “Double Indemnity” (1944) was anything but “attractive”, Rózsa shot back that the film was about ugly people doing vicious things to each other and the music reflected precisely that. Paramount’s music director was furious, but Rózsa enjoyed the support of the director Billy Wilder, and the music remained as Rózsa wanted. The film was a huge success. Rózsa received an Oscar nomination for it and thereafter he was granted a degree of creative freedom few other film composers enjoyed. Two of the most important psychological dramas in Rózsa’s filmography are “The Lost Weekend” (1945) and “Spellbound” (1945). The score for “Spellbound” is one of the most recognized of all popular film soundtracks. Alfred Hitchcock had recently seen “Double Indemnity” when he recommended to producer David O. Selznick that Rózsa should score their new psychological-romantic melodrama. They both wanted a new sound to accompany the paranoia element in the film. Rózsa immediately suggested a sound-oscillating instrument: the theremin. Its odd, other-worldly, wailing electronic sound would represent in perfect way the anguish suffered by the male leading character of the film. Rózsa was asked by Selznick to compose the music for one test sequence using the theremin. This was the famous scene in which Gregory Peck, as an amnesiac with guilt complex, takes a straight razor to the room where Ingrid Bergman, his psychiatrist, is sleeping. “Will he kiss her or kill her?” like the tagline suggested. The music was enthusiastically received and Rózsa was told to include the theremin throughout the score. It would be the first time that the theremin was used throughout a score in a feature film produced in America. Following “Spellbound”, the theremin was established as the official instrument of psychosis. Along with the images evoked by the theremin, the music of “Spellbound” also contains reflective and tender moments of lyrical beauty, calm, and loving in the midst inner turmoil. In later years, the score of “Spellbound” was to be adapted into a concerto and in this form it has been recorded many times and features frequently in classical concert performances. The story behind “The Lost Weekend” (1945) score is an excellent example of how the wrong music can destroy a film, and how the right one can vastly improve it. The main character of the film was an alcoholic and the initial musical approach (a temp score) was quite sporadic with a jazz atmosphere in the style of Gershwin. When the film previewed, the music made the audience wrongly believe that it is a comedy. As the film progressed, its real dramatic spirit was ultimately evident to the disappointment of the audience. The director Billy Wilder waited for the applause in vain and he was devastated at the outcome. In the hours that followed, there was talk about shelving the film forever. Rózsa tried to explain to the producer Charles Brackett that the music was to blame for this outcome. Rózsa decided that the film needed a strong musical support. He composed a heavily dramatic score and saw a parallel with his recently completed score for David O. Selznick’s “Spellbound”. The alcohol problem in “The Lost Weekend” seemed also to suggest the use of the theremin to underline the craving, despair and agony of the main character of the film. With the right musical approach this time, the film was so successful that won Academy Awards for Best Picture, Best Direction and Best Actor in a Leading Role! Rózsa’s score practically saved the picture and was nominated, but lost to himself for the score of “Spellbound”, which was also nominated in the same year. In 1945, the already highly respected Rózsa became a professor of film scoring at the University of Southern California (USC), where he would remain for the next twenty years. Of all his students over the years, only one achieved one of the greatest film scoring careers in the decades to come. What he learned from his professor was to take his own path and follow his own musical instinct when he composes music for films, and that distinguished him in the eyes of his professor. The student, of whom his once-professor was always proud, was to become one of the greatest composers of his generation; Jerry Goldsmith. With the notion that every kind of picture needs its own musical approach, Rózsa introduced a new phase in his compositional skills and tackled with the brutal images of gangster films. The composer’s musical output from his third creative period differs vastly from the former and the next one. Producer Mark Hellinger hired Rózsa to compose music for the now-classic gangster film “The Killers” (1946). One of the remarkable aspects of Rózsa’s film noir scores is that they are devoid of jazz, when jazz was so often used in the genre to characterize the seedy underworld. He saw the characters of these films as sinister, rather than jazzy types. Therefore, he focused on a powerful and brutal orchestral language, using a constant driving force to musically describe the actions of the cold-hearted characters on screen. Tension and sharp rhythms were necessary to the music of “The Killers”, in order to maximize the impact of the images to the audience. The music was nominated for an Academy Award. By the time Rózsa was about to sign an exclusive contract with Metro Goldwyn Mayer (MGM) in 1948, he was considered a leading figure in film scoring. The studio was about to become the expert in historical films and sweeping epics and was looking for a unique talent to guarantee the high standard of the upcoming productions’ music. In the golden age of cinema where the studios were powerful, Rózsa was the one to impose specific terms to the studio and not the reverse. He would select the films that he’d like to write music for, he would compose at the privacy of his home, he was allowed to teach at USC and he would take the summer off in order to concentrate on his own classical compositions. No other composer had the luxury of so many and such privileges! The “Rózsa sound” most associated with the MGM period of his career is the richly orchestrated, beautifully layered scores for spectacles such as “Quo Vadis” (1951), “Ivanhoe” (1952), “Julius Caesar” (1953), “Knights of the Round Table” (1953), “Ben-Hur” (1959), “King of Kings” (1961), “El Cid” (1961) and many more. In each case, the composer insisted on traveling to the locale of the story and studying the indigenous musical forms. The resulting scores were always musically accurate and perfectly suited to the historical context they enhance. When preparations for the massive production of “Quo Vadis” began, Rózsa was certain that the picture would be the perfect project for composing “roman” music and delving into the history and culture he so much loved. “Quo Vadis” was MGM’s answer to Paramount’s very successful “Samson and Delilah” (1949). The goal was to make the most epic film up to that time. The music of “Quo Vadis” Rózsa was about to compose, had three different facets: the Romans, the Christians and the slaves. Each one of them had to be attached to its own musical synonym. Rózsa devoted a lot of time to extensive research on the music of the roman era. Since no actual record of any music of the era has survived, Rózsa had to invent some, taking the Greeks as source of material. The Roman culture was heavily influenced by the Greek culture, music included. Rózsa had to find an archaic-sounding harmonization using his compositional skills and instinct along with ancient Greek musical elements in order to develop his own perspective of roman music. For the Christians and their hymns, Rózsa had to go back to the origins of the Gregorian hymns, and for the slave music of the film he was inspired by the ancient musical tradition of Syrians, Babylonians and Egyptians. The enormous commercial success of “Quo Vadis” led to the dominance of the roman-biblical epic film genre for the next ten years in Hollywood. Film extravaganza was the only weapon the Hollywood studios had back then in order to impress the audiences and turn them away from the rapidly spreading television sets. On a musical basis, the epic films of the period that didn’t have Rózsa’s signature sound, used to imitate it. In the long list of roman-biblical epic films in the twilight of the golden age of cinema, a distinguished place is most certainly secured for the epic of epics: “Ben-Hur” (1959). Rare in the history of motion pictures, we meet such a successful film on a commercial and artistic level: an absolute triumph! A masterpiece of cinematic splendour awarded with eleven Academy Awards, including the monumental score, composed by Miklós Rózsa. There was never really a doubt as to who would write the music for the film, as only one was the expert after all. Because of the immense size of the production, Rózsa was given 18 months to compose the music and his primary concern was to be as accurate to the roman style as it gets. In order to achieve that, he combined Greek, Jewish and various oriental musical elements, resulting to his own roman inventions. The film called for a vast musical canvas, surely one of the biggest in film history. Special mention must be made for three exceptional musical set-pieces: the main titles of the film, the love theme for Judah Ben-Hur and Esther and the absolute roman march, which is heard in the film before the parade of the charioteers. For the love theme, Rózsa composed a stirring melody, not only one of the most beautiful of his career, but one of the most enchanting ever written for a film! Enriched with a clearly Jewish character, it attributes the purest sentiments of love and devotion with a unique lyrical way. As for the roman music per se, musical set-pieces like “Prelude” and “Parade of the Charioteers” are considered his greatest creations referring to the roman glory. The last epic film Rózsa would score under contract to MGM was “El Cid” (1961). Independent producer Samuel Bronston was more than satisfied with the score Rózsa composed for their previous collaboration, “King of Kings” (1961), and wanted to have him on board “El Cid” which, by the way, was not an MGM production. Bronston made special arrangements with MGM, in order to secure the valuable services of the composer. Rózsa traveled to Spain to study on the Spanish music of the Middle Ages, a procedure the composer was eager for and always enjoyed. An expert on the Cid, Nobel Prize-winning historian Dr. Ramon Menendez Pidal helped Rózsa discover Spanish folk songs and dance music that derives from the 12th century. With this material at his disposal, Rózsa was ready to compose the music absorbing all the available sources and translating them into his own musical voice, the famous “Rózsa sound”. For “El Cid”, starring Charlton Heston as the legendary Spanish hero, Rózsa composed a miracle of a score. The outcome is nothing less than masterful, an unforgettable piece of symphonic film music, one of the greatest ever composed that comes from the heart and genius of Miklós Rózsa. In 1962 Rózsa’s contract with MGM studio was terminated. So was the fourth and last creative period of his career. Changing aesthetics (popular music began to insinuate itself into the fabric of film music), the dissolution of the studio system, and a new crop of talented composers relegated the former giants to either television or retirement, with only the occasional film assignment. From 1962 to 1970 he scored only four films, and eight more through his last film score in 1982. During the 70s, disaster and horror films were very common and Rózsa was offered quite a few. He intensely hated them and rejected all of them. Despite these conditions, a number of directors from the youngest generation were seeking that vibrant “Rózsa sound” for their films, the film music touch from the good old-fashioned Hollywood glory. Films like Alain Resnais’ “Providence” (1977), Larry Cohen’s “The Private Files of J. Edgar Hoover” (1977), Jonathan Demme’s “Last Embrace” (1979) and Nicholas Mayer’s “Time After Time” (1979) kept alive the musical torch of the great master of the golden age of film music. The slow down of film projects gave Rózsa the opportunity to concentrate in his own classical creations with great results: “Notturno Ungherese” (1964), “Simfonia Concertante for Violin, Cello and Orchestra” (1966), “The Piano Concerto, Op.30” (1967), “Tripartita, Op.33” (1972), “Concerto for Viola and Orchestra” (1979) and “Sonata for Ondes Martenot, Op.45” (1989) among others. On one particular occasion though, Rózsa managed to marry his classical compositions with a film score on Billy Wilder’s “The Private Life of Sherlock Holmes” (1970). After the director’s insistence, the composer found fascinating the idea of using his “Concerto for Violin and Orchestra” (1956) to the score of the film. Although the task of adapting his violin concerto was one of the most difficult Rózsa had encountered in his career, the final score – embellished with new thematic material – was nothing short of amazing, one of the composer’s greatest moments in the twilight of his career. The last film ever privileged with the musical signature of Miklós Rózsa was the film-noir spoof “Dead Men Don’t Wear Plaid” (1982). Director Carl Reiner had a special reason to want Rózsa taking the musical challenge pointed by the film: extracts from old film-noir and gangster films from the 40s were used extensively in the film, all of which had a musical score written by Rózsa. While the director was able to use those scenes from the golden oldies, he couldn’t use the music that accompanied them. An effort to obtain the rights of the music was initiated but it was unsuccessful. Miklós Rózsa would re-compose music for those same scenes, almost forty years after the very first time they were introduced to him! The single track that stands out in the score of “Dead Men Don’t Wear Plaid” is the end credits. Someone who doesn’t know where this track comes from, there is no way he would imagine that it was composed for a film-noir spoof starring Steve Martin! Rózsa gives an unexpected and at the same time powerful musical statement not only to the film but to his long and fertile career with music that reaches epic proportions and would feel really comfortable in every single other historic or biblical spectacular of his filmography. In that way he ends his golden voyage in an art he was always the respected pioneer. In a strong and noble manner. Rózsa passed away in July 1995. During his work in Hollywood, Miklós Rózsa won three Academy Awards (“Spellbound”, “A Double Life” and “Ben-Hur”) and was nominated 17 times. Although certainly one of the most gifted of the last century’s composers of classical works, Rózsa had a vibrant rapport with the dramatic, which combined with his interest and background in musicology and a highly individualistic style, has made him an ideal composer for the screen. His bold, powerful style is firmly rooted in Hungarian origins. His solid German training at the Leipzig Conservatory, where he received his doctor’s degree in music, explains the discipline of his writing, his mastery of orchestration and expert use of cross-rhythms, displaced accents and counterpoint. His trademark devices like the vibrant sound, the bold and exotic thematic material, the sense of adventure, the epic scope, the agitated propulsive rhythmic development, and the distinctive sense of drama, made his scores some of the most fresh and exciting in the cinema. Few other film composers have produced soundtracks so integral and indispensable to the pictures they underscore. In a field crowded with talented, classically-trained composers, Miklós Rózsa in particular stands out for his musical versatility, skill, taste and significance. Booklet notes from the RCA Victor release of “Spellbound: The Classic Film Scores of Miklos Rozsa”. Booklet notes from the Stanyan Records release of “Spellbound”.